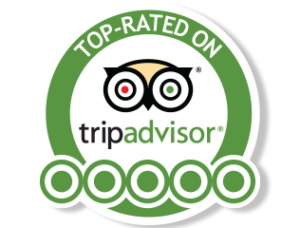 Diving Adelaide ~ South Australia’s Premier 5 Star PADI Dive Centre, Scubapro Dealer of the Year and PADI Green Star Award Holder. 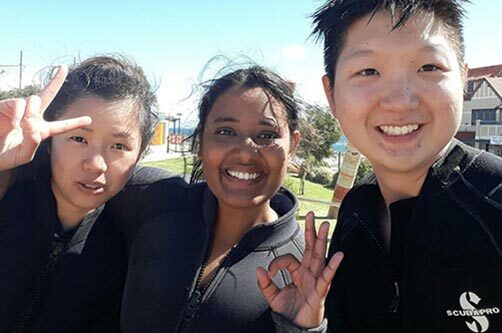 Know that you will be in good hands when you join Diving Adelaide for your first underwater adventures or your first dives in Adelaide! 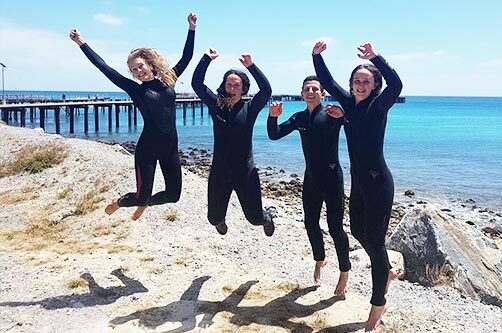 Our experienced and fun team of diving professionals can’t wait to show you our marine emblem, the leafy sea dragon, and to show you what scuba diving in South Australia is all about! 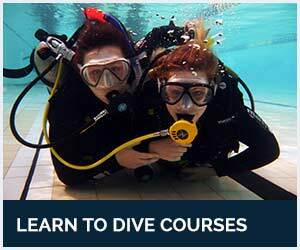 Learn to dive in the beautiful waters surrounding Adelaide! Explore the other 70% of the planet by getting PADI Open Water Diver certified in South Australia and dive the countless jetties, wrecks and reefs with us! 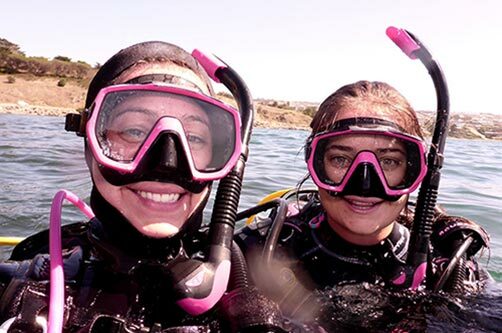 Join our awesome dive guides on a double guided dive at one of our world famous dragon dive sites: Rapid Bay or The Bluff. Get up close with the elusive leafy sea dragon and take spectacular underwater photographs! Extend your skills, explore more sites and experience greater depth! Take the next step by signing up for your PADI Advanced Open Water Diver course and explore even more of our beautiful oceans! Find the best deals and a full range of our products on the web in our online store! 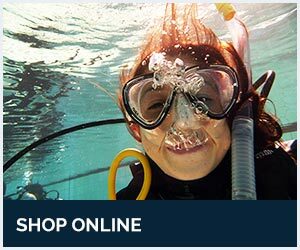 Online Dive Gear is Australia’s main online store for top scuba diving brands like Scubapro, Halcyon, Tusa, Probe and more! Meet The Locals ~ Every diving area has its favourites and so does South Australia, and we’re not just talking about the marine life ;). South Australia has heaps of spectacular shore and boat dives, but the best local marine life can be found under our beautiful jetties! Dragons (both the weedy and leafy kind), sea lions, pyjama squid, seahorses, bobtail squid, the giant Australian cuttlefish, blue ring octopus and lots of different angler fish are only a few of our local favourites! The main drawcard in our South Australian waters are our dragons. 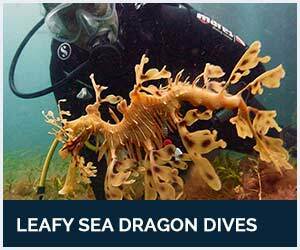 Most common in our waters is the leafy sea dragon, but we regularly spot both weedy and leafy sea dragons at our two world famous dragon dive sites: Rapid Bay Jetty and The Bluff. Join our experienced professionals on a trip down south to find and photograph these graceful creatures. Oftentimes called the puppies of the sea, the Australian sea lion is the most playful creature you will encounter in our waters! They will follow you around, nibble on your fins and play with your bubbles! With a bit of luck you can encounter them at many of our local dive sites here in SA and when you do, it will be a great experience you won’t soon forget. 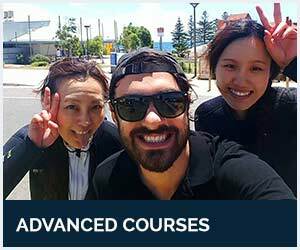 At Diving Adelaide, we’ve got a broad team of PADI dive instructors and divemasters leading our guided dives, running our courses and managing the dive centre and online store! We exclusively have dive professionals on the team, all with a minimum of Divemaster level, so whoever you talk to, you can rest assured you’re in good hands! We offer the lowest student to instructor ratio (a maximum of 5 students per instructor any dive course!) to make sure you get the best and the safest experience! All the gear will be included in your course (including mask, snorkel and fins! ), so you will not have to invest in any of your own equipment! All our school hardware is Scubapro gear, so you will be diving with the highest quality school/rental regulators and dive vests! Get to us easily, either by car or public transport! Our dive centre is centrally located only minutes from Adelaide’s city centre by car or just a quick tram ride away! We’ve got plenty of car parks out the back of the dive centre, we’re right next to tram stop 6 (literally a 1 minute walk away) and by being on South Road, we’re right on the main road to all the best dive sites!